The Snowhole Rapids Wilderness Study Area is located about 8 miles southwest of Cottonwood, Idaho, as the crow flies. Of the 5,068 acres included in the property, none are recommended for receiving the final "Wilderness Area" designation. Part of the reason for the "thumbs-down" is the property is about 20 miles long but only 1/2 mile wide as it extends up the slopes on both sides of the Salmon River from just below China Rapids to American Bar. Another part of the problem might stem from the heavy usage this area gets from whitewater rafting enthusiasts. The countryside is purely steep and rocky river canyon. The terrain is diversified a bit by numerous other perennial and intermittent streams that drain into the Salmon along this stretch. 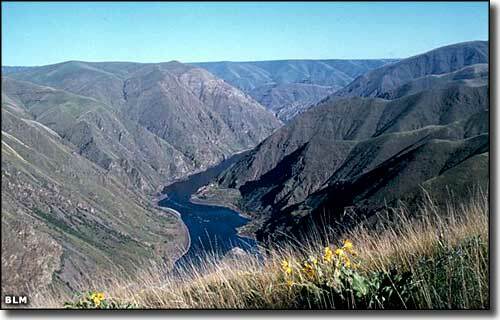 Elevations vary from the Salmon River low at 1,200 feet to a high at the canyon rim above the Mahoney Creek drainage at 3,800 feet. Some of the north and east facing slopes offer a few pockets of tree cover and there are scattered clumps of shrubs and herbaceous species but most of the countryside is covered with various native grasses. For wildlife you'll find white-tailed deer, mule deer and chukar partridge. The river fishing might be good but there's three species that are on the threatened and endangered lists: Chinook salmon, steelhead trout and sockeye salmon. There are also some white sturgeon and some non-native smallmouth bass.